We recognise that many visitors to the Great Barrier Reef are not content to just look and wonder at its marvels. Most are anxious to ask questions and increase their understanding of how this complex system works. To help visitors understand and learn about what they are seeing, marine biologists are included as crew onboard all of our cruises to the Outer Reef and Low Isles. Our marine biologists conduct DVD presentations discussing general reef ecology and other related topics. A major focus is to inform visitors of what they can do at the reef not just to enhance their experience, but also to protect the reef from intentional or unintentional damage. At the Outer Barrier Reef, Reef Biosearch biologists conduct guided snorkelling trips for small groups of snorkellers as an optional activity. In the water, the biologist provides and an introduction to the marine environment as well as how to recognise fish and corals and many of the less conspicuous animals of the reef. Snorkellers are encouraged to use as many senses as possible - to lie still, look, listen and touch only gently those things that will be unaffected under the direction of the marine biologist. 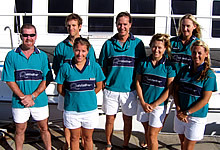 These trips are aimed at providing the visitors to the reef with an insight into the basic ecology of the reef and perhaps more importantly, through increasing their understanding of how this fragile system functions, it is hoped that passengers will appreciate the need to preserve such a wonderful natural ecosystem. Research aspects and the problems coral reefs are facing world-wide are highlighted with emphasis on what we can do to counteract this. These trips cater for both novices and the more experienced, who will enjoy a more adventurous trip to visit reef wall drop-offs, drift snorkel or whatever the day offers best. Included in your day’s activities at Low Isles, marine biologists conduct guided snorkel tours as well as interpretive beach walks introducing visitors to the plant and animal life of the island and surrounding reef. The Low Isles heritage trail is also part of the beach walk providing guests with information on the Aboriginal and European history of the island and the surrounding local communities.